Self-assembling biomaterials: molecular design, characterization and application in biology and medicine provides a comprehensive coverage on an emerging area of biomaterials science, spanning from conceptual designs to advanced characterization tools and applications of self-assembling biomaterials, and compiling the recent developments in the field. Molecular self-assembly, the autonomous organization of molecules, is ubiquitous in living organisms and intrinsic to biological structures and function. Not surprisingly, the exciting field of engineering artificial self-assembling biomaterials often finds inspiration in Biology. More important, materials that self-assemble speak the language of life and can be designed to seamlessly integrate with the biological environment, offering unique engineering opportunities in bionanotechnology. 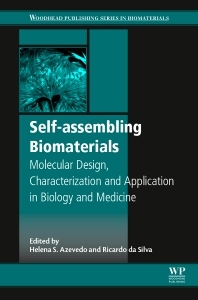 The book is divided in five parts, comprising design of molecular building blocks for self-assembly; exclusive features of self-assembling biomaterials; specific methods and techniques to predict, investigate and characterize self-assembly and formed assemblies; different approaches for controlling self-assembly across multiple length scales and the nano/micro/macroscopic properties of biomaterials; diverse range of applications in biomedicine, including drug delivery, theranostics, cell culture and tissue regeneration. Written by researchers working in self-assembling biomaterials, it addresses a specific need within the Biomaterials scientific community. Dr Helena S. Azevedo is a senior Lecturer in Biomedical Engineering and Biomaterials at Queen Mary University of London, UK. She has more than 15 years of research experience in biomaterials engineering and has developed significant work on the development of self-assembling biomaterials for biomedical applications. Dr. Ricardo da Silva has 13 years of research experience in the field of Biomaterials for Regenerative Medicine applications. His research work covers thermo-responsive polymers for drug delivery and cell sheet engineering, peptide self-assembly and supramolecular chemistry. He is a Research fellow at King’s College London, at the Centre for Craniofacial and Regenerative Biology, where he develops his research activities in self-assembling biomaterials and bone tissue engineering.